DIET, DESSERT AND DOGS has moved! Please click here to go to the new site! As always, thanks for reading. Hope to see you at the shiny new Diet, Dessert and Dogs! In my short stint as a raw foodist (very different from an “in-the-raw” foodist, which, for obvious reasons, I’d never do) I was determined to try out every variation of living foods imaginable. This meant foods I’d otherwise probably never eat, such as raw fennel (basically just don’t like it); raw cashews (okay, but too bland on their own for my taste); raw cacao nibs (not bad when ground up and incorporated into some form of dessert); and raw sushi. What? Sushi is already raw, you say? Ah, but I’m not talking about fish. Rather, I’m talking about fish-y, or fish-like, sushi, composed of raw nuts and veggies. And waaaay better than slimy, slippery, dead tuna! This recipe pairs almonds and sundried tomatoes for a magical synergy that results in a filling reminiscent of saltwater and salmon without actually being salmon (or John Malkovich, for that matter). You enjoy the essence of the sea without having to eat any fish! How cool is that? I have to admit, however, that I might never have ventured to try this particular dish if not for my beloved, the carnivorous HH. In fact, before we met over a decade ago, nary a nibble of sushi in any form had passed my lips. I had steadfastly refused to join all my friends when, throughout the late 1980s and 1990s, sushi reigned supreme as the Favorite Form of Yuppie Sustenance (and I suspect that, even today, it would attain runner-up status, at least). You see, I’ve seen raw fish; my dad used to bring home a whole fish occasionally from his butcher shop, and my mom always refused to touch it. Me? Eat raw fish? No, thanks. In Toronto, you can find a sushi bar on almost every corner of the downtown core, plus most streets in the suburbs (that’s almost as many sushi restaurants as there are donut shops!). For years, whenever I planned to meet a girlfriend for drinks after work, join colleagues for a quick bite after class, or share a dinner with my book club, mine would be the lone voice demurring across a vast sea of sushi. And then, the HH invited me to lunch. Well, technically, he invited me to lunch, again. One of the more pleasant aspects of my particular work schedule is that I have the freedom to run errands, do laundry, or anything else during the afternoon and work all evening instead, if I choose. Once a week, I exercise that freedom to meet the HH for lunch. It’s our way of keeping the romance alive getting our 5 to 10 a day escaping the “kids” checking in and staying connected with each other. One particular day, after much pleading and cajoling, he finally convinced me to join him at his favorite sushi restaurant. “They’re bound to have vegetables, right?” he theorized. I had to agree. “And they’ve definitely got rice.” So far, so good. “Well, I’m sure they know how to roll it in a nori sheet, so I bet they can put together some vegetarian sushi for you.” How could I object? I’ve been thanking him ever since. When I explained what I wanted to the shop’s petite hostess, she cocked her head, smiled and nodded, then returned a moment later proffering a platter of nori rolls, futo maki and hand rolls filled with various combinations of carrot, cucumber, umebosi plum, buttery avocado, and daikon. In addition to being visually impressive–each unique spiral mosaic of orange, green, and creamy white a testament to the chef’s culinary artistry–the rolls also served up that classic melding of sweet, salty and umami, which, when accompanied by pickled ginger and fiery hot wasabi, was enough to hook me for life. How, I wondered, had I ever allowed myself to miss out on such an indulgence before then? I still love vegetarian sushi, and these days, the HH and I eat it exclusively at our weekly lunch date. Still, there are times when I’m snowed under with marking, or the HH has been summoned to an unexpected conference call, and we defer until the following week. On those occasions, I try to make this raw version instead. Completely grain-free, it nevertheless contains a similar satisfying blend of flavors and textures to the real thing. And the inclusion of ground nuts here actually renders this version almost as protein-packed as its fishy predecessor. Like all sea vegetables, the nori is replete with minerals, particularly iodine, necessary for proper thyroid functioning. It also provides Vitamin K, essential for healthy blood. And, best of all, it’s completely fish free. Given that these darlings are uber-healthy, I thought they’d be a perfect contribution to Cate at Sweetnicks‘ ARF/5-A-Day weekly event. You can check out the roundup every Tuesday. I got this recipe from a raw foods class that I took a few years ago. The rolls require a little planning in order to prepare the nuts and sundried tomatoes, but once those iare ready, the remainder of the dish comes together quickly. These are best served soon after they’re made. My husband was just asking me what RAWIST (is that a word?) use to stuff nori rolls. And you just answered his question. Oh boy those look fabulous! Yum!!!!!!! Those look so delicious! They’re just beautiful… I may have to try my hand at these for my sushi-loving dad on his birthday in a few months. Lovely idea Ricki. I’m very intrigued by this recipe. I’m a huge, huge fan of Japanese food – although it’s hard to get a decent vegetarian choice at most places. But love all the seaweed, tofu, pickles, noodles and vegetables that are used. I have the tiniest food processor, which is slightly painful to use – but think it would be worth it for these! Love your wit (as usual), and these do look good. I still haven’t made my own nori rolls (though I have some sheets sitting in my cupboard just waiting to be used). I might just have to try this! 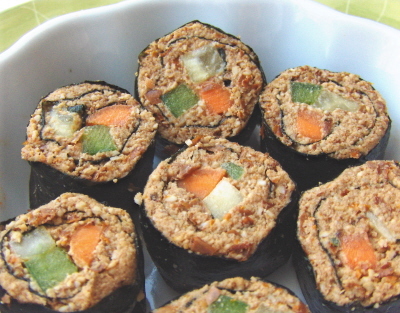 I love vegan sushi too, and would love to try these rolls! What a neat coincidence! Glad to be of service. (Oh, and according to my “raw” instructor, they’re called “Raw Foodists”). Hope you try them out. I’d halve the recipe (or even cut it into thirds). This amount is good for quite a few rolls, I find, and we usually have it 2 days in a row to clear it up. Half would be great for appetizers for two or three. Thanks so much. I was actually surprised at how easy these were–forgot to say that I don’t have a sushi mat, and they still come out just fine 🙂 . These are a nice change from the rice-based ones and worth a try, I think! Oh my gosh those look so good. And perfect. Perfect little raw sushis. I made “raw sushi” once from a raw cookbook that has generally failed to impress me – it was just nut butter spread on the nori with veggies inside. They got all gooey, and I figured I could’ve just dipped carrot sticks in almond butter and gotten the same satisfaction. Wow! These look so good! I’m gonna try them. I’m a great sushi lover! I’m so glad you think they’re perfect as-is–I don’t use a mat and actually prefer the slightly irregular shapes! Too bad about those other sushi, though. I can’t imagine plain nut butter inside nori!! Great–let me know how they come out if you do try them! This looks delicious! I just saw your link from Heidi’s page. I looked at your photograph and almost did not start reading because I thought “these aren’t for me”…but then I realized that it was a mash of nuts and tomatoes! I assume you are from Toronto since you mention TO’s abundance of sushi restaurants?